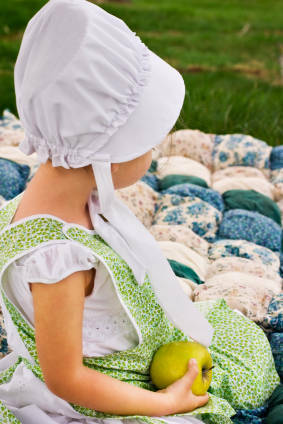 Amish children are disciplined to be respectful and obedient to their elders. In fact, at an early age they are assigned chores which help them acquire a wide range of skills that will benefit the family as well as the community. To prevent their children from becoming spoiled, the parents teach their children to "surrender" their selfish will as opposed to always trying to get their own way. Living in a large family also requires the virtue of yielding to others. Overall, cooperation rather than competition is taught at home and at school. Although child rearing is primarily the role of the parents, there is close and continuous interaction with the extended family that includes grandparents, aunts, uncles, as well as neighbors. The children are taught that they constitute a vital part of their community. Pennsylvania Amish Children entertain themselves by participating in the local Little League team, the Brownies or other community activities. During their teenage years, the Amish kids often join a"crowd" of Amish youths which may number as many as a hundred or more. These Amish youths attend Sunday evening singings as well as traditional recreation such as softball, sledding, hiking, and skating. Despite their disciplined upbringing of humility and obedience to authority, Amish youths sometimes rebel in their late teen age years. Perhaps surprisingly, this rebelliousness is often tolerated by the parents and church elders. Like non-Amish teenagers, this rebelliousness is often a phase, since the majority eventually become dedicated and respectful church members. Sometimes the rebellious crowds of Amish youth openly flout their church's teachings. Some of the groups have barn parties which are also know as hoedowns. The more rowdy of these parties involve alcohol. Occasionally, Amish teenagers are arrested for underage drinking as well as driving a buggy or a car under the influence of alcohol. Although the Amish generally prohibit the ownership of automobiles, it is estimated that 30% of Amish boys own cars; 40% have a driver's license; and, 70% have driven a car at some point in their youth. It is not uncommon for some of the more rebellious Amish Lancaster County youths to spend a weekend in Philadelphia, New York City or other large cities for fun. At such times, it is not unusual for the teenagers to discard their traditional clothing in favor of store-bought clothes that are currently in fashion in the non-Amish society. Usually, the Amish teens blend in inconspicuously with the urban crowds. 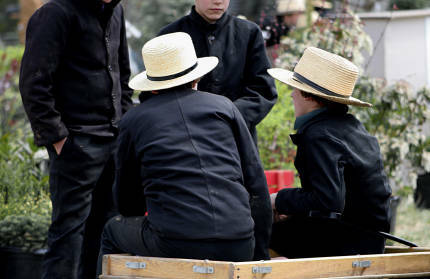 While parents and church leaders might feel embarrassed when the Amish youth violate the strict teachings of the Amish church, it is usually tolerated to a large extent. Why? Perhaps because it offers young Amish adults the opportunities to explore the outside world before they commit themselves fully to the strict regulations of the church. Before their adult baptism, they are generally free to experiment without fear of excommunication or shunning. In other words, by having an opportunity to "sow their wild oats," Amish youths are granted the choice on whether or not they want to be Amish and follow the rigid regulations which that decision entails. It is estimated that about 80% of those young Amish adults who rebel, eventually choose to remain Amish.